(left) 20,000 lb. Mil Pinion after blasting at Derrick. (right) 40,000 lb. Machine Base being blasted and prepped for paint. 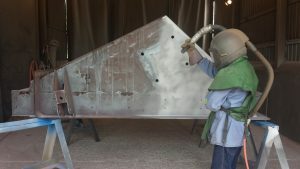 Paint and coating manufacturers recommend Abrasive Blasting as the best method to prepare surfaces prior to the application of their products due to its ability to remove surface contaminants while also imparting an anchor pattern/profile to the substrate, which greatly improves adhesion. Abrasive blasting reduces surface prep time compared to manual hand tool cleaning, from hours to just a fraction of the time. Derrick offers a variety of blasting methods and blast media to customize the surface prep process to meet your precise specifications. Derrick has four large blast rooms to process very large, medium, and small industrial components. We also have tumble and table blast machines for processing smaller and high volume parts.